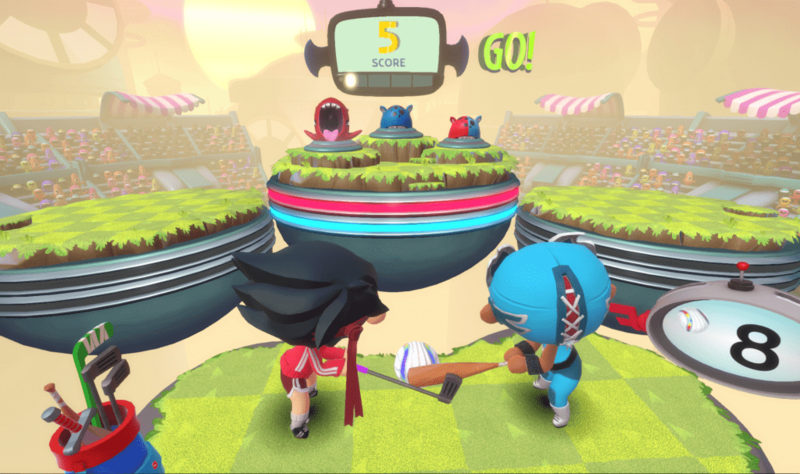 Super Beat Sports succeeds thanks to simple controls coupled with increasingly hectic gameplay. Harmonix has always been fantastic at making rhythm games, but this newest title is infused with a great deal of style, heart, and challenge, making it a very well rounded experience for anyone looking for a purely fun rhythm-based adventure. The game doesn’t have a strict story mode. Instead, there are five unique modes to choose from: Whacky Bat, Net Ball, Gobble Golf, Buddy Ball, and Rhythm Racket. The first three can be played with up to two players and are split into tiers, each with three levels to tackle. The last two can be jumped into with ease and accommodate up to four players. 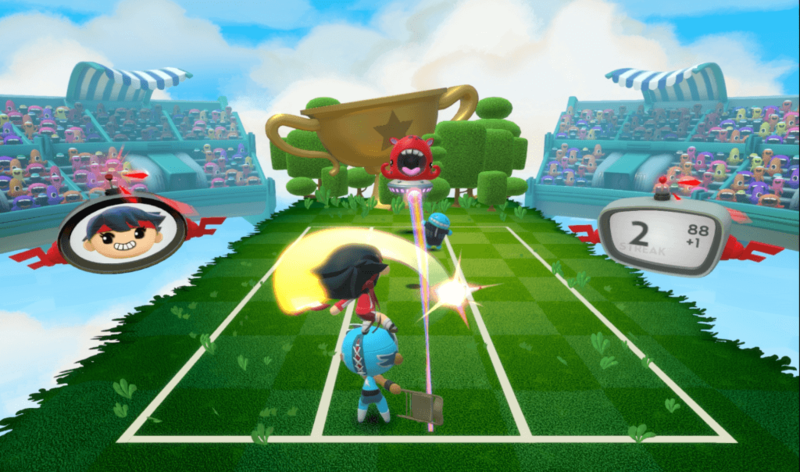 The entire game is based on one main mechanic – wielding a bat and hitting a ball back at oddly colored aliens who like to lob baseballs in a catchy rhythm. No matter the sport, whether it’s baseball, volleyball, golf, or some amalgamation of the above, you always have some sort of bat in hand and need to time your hits perfectly to send the balls flying back into the faces of the joyful aliens who serve as your competition. Super Beat Sports is at its best when it’s at its simplest. The controls are never more complicated than press a single button and move to either side. Things do get quite difficult though, especially when the tempo starts to increase and the balls are soaring towards you, giving you mere seconds to react. If you connect with the ball you are rated on a scale of ‘Late’, ‘Early’, or ‘Perfect’. The higher your streak and the more perfects you rack up, the better you do. In my time with the game, it’s not very difficult to get a perfect hit. It’s not so much about listening to the rhythm the balls come at you, as just eyeing the projectiles and sending them rocketing back at the perfect time. Eagle-eyed players will have no trouble earning at least a gold medal on most levels. Earn a gold medal in an event and you’ll unlock Pro Mode, which, predictably, makes things much more fast-paced, adding extra lanes to move between and much more complex ball patterns to follow. If you find the main game too slow-paced, jump over to this mode as soon as you can and you’ll get the challenge you’ve been craving. Of all the events on offer, Whacky Bat has the most to offer. With nine tiers to bat your way through, it is the longest event in the game by far. Zipping between the three lanes, swatting the balls back at the various aliens, each with their own speeds and styles doesn’t grow old quickly. As you progress through the levels the game gets quite difficult. I never failed out of an event or performed poorly, but I found myself hitting balls seconds too late, bringing down my score as the temp climbed and reached a crescendo. Your reward for performing well, other than the satisfaction of seeing a small gold ribbon next to every level, is a series of collectible bats and outfits. They are purely cosmetic, but dressing up as a hockey player and hitting baseballs with a garden gnome has a certain charm to it. But what about the most important part of any rhythm game, the music? An underlying beat plays for each level, each one unique to that stage. When the aliens lob a ball at you they squeak and squawk, adding an extra layer of musicality to proceedings. Hit the balls in perfect time and your character will sing back the same melody, making for a distinct style of electronic music. 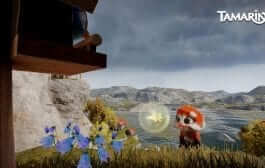 The game’s own characters literally control the music, making it unlike other music games on the market. I enjoyed every song I heard, and there’s a large enough selection that you won’t get bored. 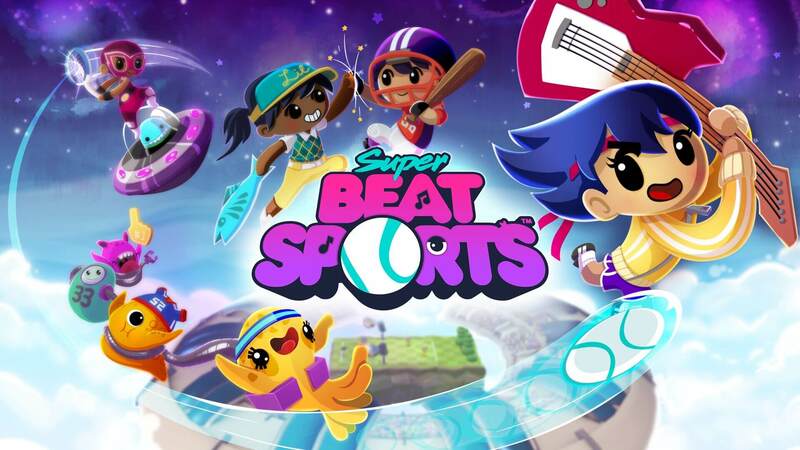 Super Beat Sports quickly establishes that it has a style all its own, and the music is the biggest part of that. The game’s sleek, cartoonish visual style gives the game a light, breezy feeling, even when the beats are flying at you and your thumbs are frantically mashing buttons. With five events to master and pro modes in three of those, there is a lot of game here, and even if you don’t fail a single level, it’ll still take you quite a while to work through all of them. Super Beat Sports is exactly what I want from a Harmonix music game. The lack of a story means the gameplay is the sole focus, and the short levels make it perfect for pick-up and play session on the Switch. Whether you’re playing docked or in portable mode, the visuals and framerate remain consistent. Verdict: It isn’t the deepest of titles, but what it does, it does well. It lacks some of the depth of other music games, but it makes up for it in charm and catchy original music that is literally out of this world. If you’ve been craving a unique, quirky indie title on Switch, look no further than Super Beat Sports. Super Beat Sports is a rhythm sports game developed by Harmonix, the creator of the RockBand series. Go BALListic with rhythmic sports fun for 1-4 players! Super Beat Sports is a collection of five sports-themed mini-games with a twist - everything is musical. That means that you’ll need swing, volley, and score to the music in order to come out on top. Whether it is handheld or docked, the competition will be out of this world.